Kakutou Komusume Juline manga series by Kakinouchi Narumi (creator of Vampire Princess Miyu) manga series images and info. Part of a diverse shoujo anime, manga, video gaming, and live-action Japanese drama website. "Kakutou Komusume Juline" is an intriguing martial arts story by the creator of "Kyuuketsu Miyu" (Vampire Princess Miyu). 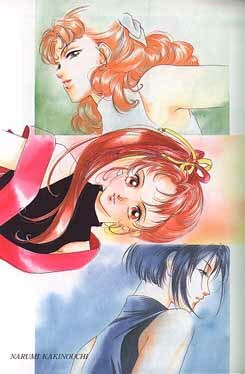 If you have any info on the manga LIN3, which seems to be a sequel to Juline, please let me know. This manga is definitely unlike any other I've seen. 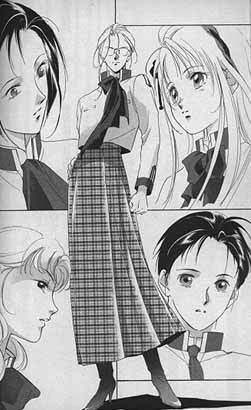 The pitch-black-in-parts-and-light-line-drawing in others really give the series a dark feel when Narumi-sensei wants it to be suspenseful or mysterious, but the humor is cute and light and there's romance in it as well. 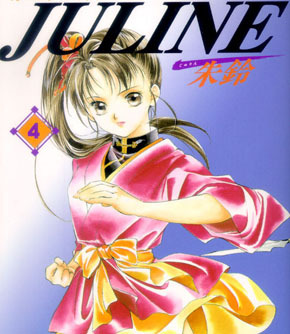 Juline is a pretty and cheerful girl who trains at a martial arts doujou of "fighters". She is the daughter of the master of the doujou, and has a friend named Kiou who also trains there. He likes to tease her. They get into "fights" but they really care for each other. Their instructor punishes them for making messes when they get upset (they crash into things sometimes) - he picks them up and takes them to scrub the floor. =) Juline is in love with a man named Ryokuha. There are two other doujou which both contain a powerful treasure. These mysterious items protect the town Juline lives in, and there is a third in her own doujou. It is said that the one who can obtain all three treasures can reign over the world. Kokuju is a man who looks like a woman. He is intent on getting the treasures, and has a slew of underlings who work at night in the dark. He meets Juline at school (perhaps he's going to be a teacher?) and seems attracted to her. Juline, Kiou, and the daughters of the masters of the other doujou join together to fight against them. The girls, Byakuya and Seika, are strong and quiet types and at first a little removed. Kokuju invites the girls to his hall to make them fight against his men. Normally the skilled girls would have no trouble at all defeating the lot of them, but each one of his men is a person close to them! How can they fight people they care about? The suspense and drama in this series is excellent.